What is Bring Me Sports Toolbar? Bring Me Sports Toolbar is an application that promises to make it possible to watch live sports on the computer. There are many sports fans out there, so this program is becoming popular. Unfortunately, it does not mean that users find it very beneficial even though some of them install this application on their computers voluntarily. Its main drawback is that it does not do anything but provides users with quick-access buttons opening pages where live sports are broadcasted. Users do not need to have Bring Me Sports Toolbar installed on their computers to open those pages, so Bring Me Sports Toolbar cannot be called a very beneficial program. Because of this, many users get disappointed with this toolbar and decide to delete it. Do not hesitate to uninstall Bring Me Sports Toolbar from your computer too if you cannot say anything good about it, or it has entered your computer without your knowledge. In this article, you will find some information about the Bring Me Sports Toolbar removal presented. How does Bring Me Sports Toolbar work? 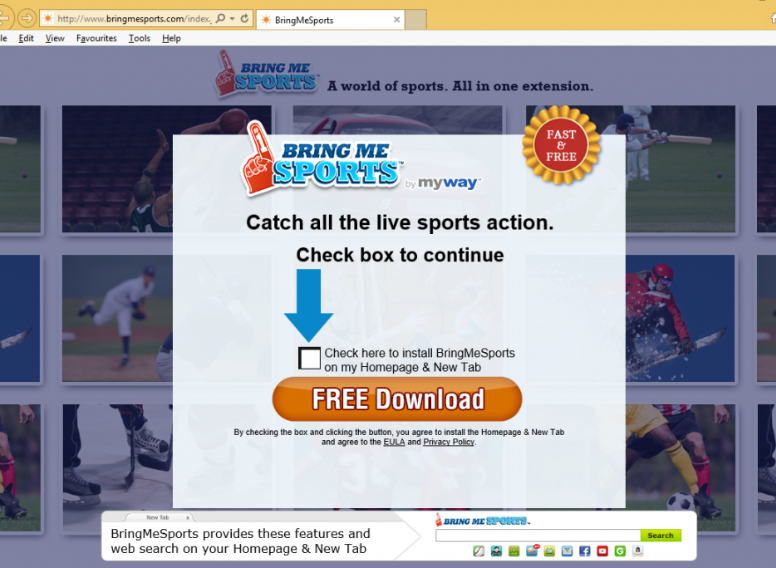 Users install Bring Me Sports Toolbar expecting that they could watch live sports, but all they get is the modified settings of their browsers because this browser plugin sets its own page as a homepage after the installation. This page contains buttons opening sports-related websites. Also, it contains a search box. You should not use its search tool, specialists say, because it has turned out that it is not reliable. It has one noticeable drawback – it might present users with commercial advertisements. There is, probably, no need to say that these ads might make it harder for users to search the web efficiently. Also, they might promote untrustworthy websites, so users might click on these ads expecting to find the information they are looking for but, instead, end up on pages promoting malicious software. Do not allow malware to show up on your system – delete Bring Me Sports Toolbar today. How did Bring Me Sports Toolbar enter my computer? Bring Me Sports Toolbar is not a serious malicious application, but it has also employed the deceptive method called bundling to show up on users’ computers. This explains why users cannot tell much about the entrance of Bring Me Sports Toolbar. Undoubtedly, there are also users who get this program from its official website willingly, but it is the exception rather than the rule. Either way, it is advisable to implement the Bring Me Sports Toolbar removal because it is not a program we can call fully trustworthy. How can I remove Bring Me Sports Toolbar? Two undesirable software removal methods exist, so choose whichever you like to remove Bring Me Sports Toolbar from your computer. Although you are free to decide how to delete Bring Me Sports Toolbar, you should be sincere to yourself and choose the suitable removal method on the basis of your previous knowledge in malware removal. If you have never done that before, it would be smart of you to erase it automatically.